For the unincorporated community in Wabash County, see Rochester, Wabash County, Illinois. Location of Rochester in Sangamon County, Illinois. Rochester is a village in Sangamon County, Illinois, United States. The population was 2,893 at the 2000 census, and 3,246 at a 2009 estimate. The village was settled in 1819, and is located in Rochester Township. Rochester is part of the Springfield, Illinois Metropolitan Statistical Area. 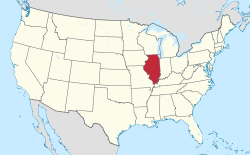 Rochester is located 4.0 miles outside Springfield, Illinois, down Illinois East State Route 29. The village is exit 96A off Interstate 55. Rochester is located at 39°45′2″N 89°32′30″W﻿ / ﻿39.75056°N 89.54167°W﻿ / 39.75056; -89.54167 (39.750625, -89.541587). According to the 2010 census, Rochester has a total area of 2.431 square miles (6.30 km2), of which 2.43 square miles (6.29 km2) (or 99.96%) is land and 0.001 square miles (0.00 km2) (or 0.04%) is water. As of the census of 2000, there were 2,893 people, 1,075 households, and 868 families residing in the village. The population density was 1,372.9 people per square mile (529.4/km²). There were 1,099 housing units at an average density of 521.6 per square mile (201.1/km²). The racial makeup of the village was 98.65% White, 0.28% African American, 0.03% Native American, 0.38% Asian, 0.03% Pacific Islander, 0.10% from other races, and 0.52% from two or more races. Hispanic or Latino of any race were 0.69% of the population. There were 1,075 households out of which 39.4% had children under the age of 18 living with them, 70.7% were married couples living together, 8.1% had a female householder with no husband present, and 19.2% were non-families. 18.1% of all households were made up of individuals and 9.9% had someone living alone who was 65 years of age or older. The average household size was 2.69 and the average family size was 3.05. In the village, the population was spread out with 27.5% under the age of 18, 6.3% from 18 to 24, 25.2% from 25 to 44, 29.7% from 45 to 64, and 11.3% who were 65 years of age or older. The median age was 40 years. For every 100 females, there were 94.0 males. For every 100 females age 18 and over, there were 88.3 males. The median income for a household in the village was $62,891, and the median income for a family was $73,191. Males had a median income of $50,875 versus $35,944 for females. The per capita income for the village was $26,881. About 0.8% of families and 1.2% of the population were below the poverty line, including 1.3% of those under age 18 and 0.9% of those age 65 or over. Located on the northwest side of the village is the Rochester Community Park, erected and operated by the Village of Rochester. The late 1990s saw massive expansion on the park, with the addition of a lighted ballfield, multiple soccer fields, and the Friendship Fort, a massive play-structure built in 1998. The park hosts many village events, including "Sparks In The Park", an annual Independence Day festival with vendors, entertainment, a carnival, and a parade. Spanning three days, the event attracts not only the citizens of Rochester, but visitors from the surrounding areas as well. Rochester is the southeastern end of the Lost Bridge Trail, a 5.0-mile (8.0 km) trail built by the Illinois Department of Transportation (IDOT) atop an abandoned railbed formerly used by the Baltimore and Ohio (B&O) railroad. It is operated jointly by IDNR and the Village of Rochester. The trail crosses the South Fork of the Sangamon River near Rochester, and crosses Sugar Creek near Springfield. Sugar Creek carries the outflow from Lake Springfield, a sizable nearby reservoir. The Lost Bridge trail name recalls IDOT's failure to prevent salvagors affiliated with the B&O from dismantling the Sugar Creek bridge for scrap. IDOT future plans include extending the trail to Taylorville, Illinois along the same railroad bed, and this was partly realized in a recent extension from the trail's original end at State Rte. 29 and N. Main St., across Rochester, to just past the intersection of State Rte. 29 and State St.
Rochester's schools are part of District 3A, headed by district superintendent Dr. Thomas Bertrand. The district lists its enrollment at 2,322 students for the 2015-2016 year. The High School lists 785 students for the 2015-2016 school year and the principal is Brent Ashbaugh, the assistant principal is Cassy Carey. The activities director is J R Boudouris. Rochester High School teachers on average make $48,052, while administrators make $87,488 on average with a 13:1 student:staff ratio. Rochester High School students, along with the rest of the state, are no longer required as part of the state's standardized testing program. The PARCC is the new standard for the state and in the first year of testing 91.9% of all freshmen are on track to graduate (Illinois statewide is 82.4%) and in 2016 Rochester had an overall graduation rate of 99% (94% in 4 years) as compared to the state rate of 86%. Construction on a new wing to the high school began in July 2005, and was finished in August 2006. Demolition of the old Rochester Junior High building also took place in the summer of 2006, and junior high students occupied most of the new wing until the new junior high facility was fully completed. A new auditorium was also being constructed for the district, and it was scheduled to be completed in early 2007. The new junior high facility was completed by January 2008. The new auditorium was completed in time for the spring musical, The Wizard of Oz, in 2008. In 2007, the Rochester High School girls soccer team once won the 2A State Championship. In 2010, the Rochester High School football team was undefeated and became the Class 4A State Champions. In 2011, the Rochester High School football team was 12-2 and won the 4A State Championship for the second straight year. In 2012, the Rochester High School football team once again won the 4A State Championship for a third year in a row. In 2013, the Rochester High School football team once again won the 4A State Championship for the fourth year in a row. In 2014, the Rochester High School football team once again won the 4A State Championship for the fifth year in a row. In 2015, the Rochester High School girls golf team once won the Class A State Championship. In 2015, the Rochester High School girls soccer team once won the 2A State Championship. In 2016, the Rochester High School girls soccer team once won the 2A State Championship for the second year in a row. In 2016, the Rochester High School football team once again won the 4A State Championship for the sixth time in seven years. In 2017, the Rochester High School football team once again won the 4A State Championship for the seven time in eight years. ^ "2016 U.S. Gazetteer Files". United States Census Bureau. Retrieved Jun 30, 2017. ^ "G001 - Geographic Identifiers - 2010 Census Summary File 1". United States Census Bureau. Retrieved 2015-12-25. ^ a b c "Illinois Report Card". Retrieved 2017-01-01. ^ IHSA. "School Directory | IHSA". www.ihsa.org. Retrieved 2017-01-01. This page was last edited on 27 February 2019, at 03:51 (UTC).